“We are not seeing visible demand for Symbian,” she said. via Samsung says to focus on Android, bada software | Reuters. Windows Phone is anything but professional and specialized. It’s designed to orphan business users and is targeted to mainstream use. Another example of head-scratching random marketing word generation. The new Apple TV has created a cottage industry of pundits debating the future ownership of your living room. This topic of to whom your living room belongs has been around since the 90’s when Microsoft sought to plant a flag on your TV set and claim it in the name of Gates with a cable box software platform. A few billion dollars later they came away with not a single deed, not even to your couch. Talk of ownership flared up again in the last decade as various game consoles and boxes paraded in front of consumers. There were wars waged over DVD formats, encoding formats and DRM. Then came hulu and Apple TV and roku and who knows what else I missed. The ownership is not for the space but for the time and attention of the audience. The time spent consuming televised content is what’s at stake. That time is increasingly being fragmented. It was first broken into tiny pieces by cable channels that divided audiences into niches. Attention was attacked with PVRs like Tivo. Demographics were exploded with game consoles with age groups separating into different modes of consumption. Migration of other portable devices like laptops, smartphones and iPads into the couch room are now further degrading the value of the “living room” as a significant target for advertisers. Internationally there never was a unified living room. Consumption patterns and even broadcast business models vary widely. Ultimately there’s really nothing in “the living room” worth fighting for. The disruptive play here is the crumbling of monolithic audiences that used to define “prime time”. It’s not a new box to take over from another box. The technologies that are coming to invade the living room have already broken it into parcels that lack cohesion. Just like the division of land among numerous generations of heirs creates land only useful for residential development, it’s time to abandon dreams of owning the farm. That farm has long ago stopped being fertile. Nokia says: "My activations are bigger than your activations"
Pshaw to all that, says Symbian. The company points out that according to Canalys’ research, there’s 300,000 Symbian devices activated on a daily basis, which equals 109.5 million phones activated annually. via Sad Nokia Wants You To Know It’s Activating 300,000 Smartphones Daily. I long for the good old days when we used to just measure units sold per quarter. 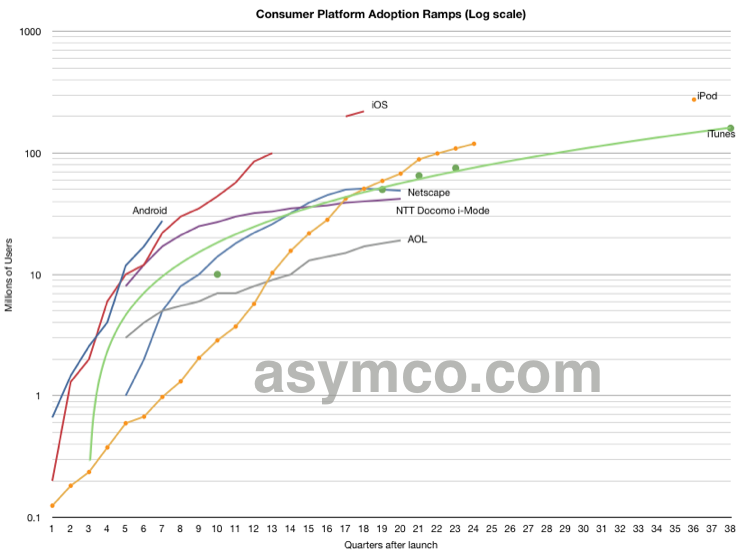 I took the venerable Consumer Platform Adoption Ramps chart and added Android and the latest data on iTunes, iPod and iOS. To make it more readable (but conceptually more complicated) I put the data on a log chart. The time span covered is nine and a half years. The top of the graph marks the one billion threshold. Reaching one billion in less than 10 years is an interesting challenge for any platform and, at first glance, it seems that both iOS and Android have a shot at it. This does not seem likely for any of the other platforms. i-Mode, AOL and other technologies with localized value networks are clearly limited to populations in their home countries. iTunes is limited by the use of a PC, which has a small footprint in under-developed countries (dependency by iOS on iTunes should throw up a red flag here). The iPod was embraced and extended by more ubiquitous mobile phones. 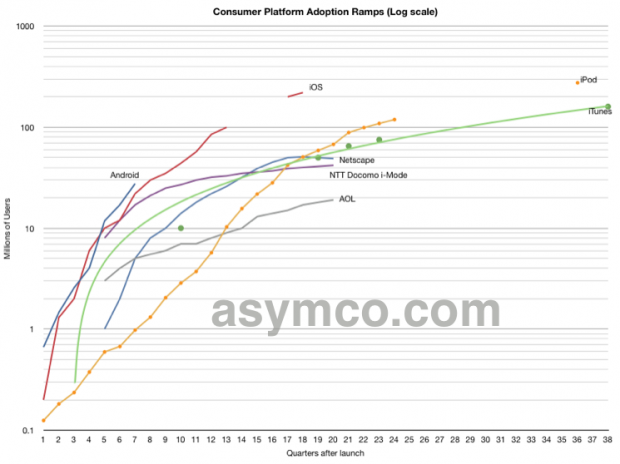 To wit, note that iOS and Android have similar curves to date and are both likely to overtake iPod and any other contender. So for the obligatory theological question: Will Android follow the curve of iOS or will it diverge and continue on a steeper trajectory? Does it matter?